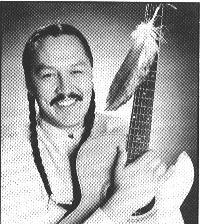 ...is a performing artist and writer from British Columbia who writes songs about the environment, the hunting and trapping lifestyle of his people ( Woodland Cree) and various issues and challenges facing Native communities,as well as all Canadians. From a world beat rhtyhm to a Cree love song, Art's performances combine old and new in a unique and refreshing style. He has the remarkable ability to move an audience from reflection to laughter with his natural and commanding stage presence,sense of humour and straight from the heart approach. Born on a reserve and raised by his grandparents, Art learned to blend two cultures that are sometimes worlds apart. He is a visionary cultural broker and communicator who uses the rich storytelling and musical traditions of his ancestors as a base for powerful melodies laced with haunting chants. After sharing the stage with some of Canada's greatest performers, Art is now moving to centre stage. My thanks go to Jaya Chauhan for giving me permission to use Art's bio from the Dreamspeakers Festival Guide.